Looking for galangal, green tea leaves straight from Southeast Asia, Kosher delicacies, and other specialty goods? Skip the chain grocery store and head to one of Connecticut’s excellent specialty grocers or markets. With a focus on high quality products and hard to find ingredients, individually owned markets are the best place to look—and the welcoming staff are sure to help you find what you are seeking. Fiddleheads is a really lovely organic grocery store and co-op that sells hard to find ingredients, produce, and beer. Their bulk section is impressive and stocked with nuts, dried fruits, and granola. They also have a great selection of fresh produce, organic baby foods, and body products. Mystic Market is a lovely grocer and prepared food store with high-end handmade foods with many local options. Their freshly made lasagnas are great for heating up at home after a busy day at work. They also have great soup options, sandwiches, pastries, and coffee. Enjoy a calm lunch at one of the Mystic Markets or opt for a take-away meal for dinner. Opened in 1949 by a father and son in Bethel, Carluzzi’s quickly expanded to a larger space in Bethel (its current location) due to the popularity of this grocer for food orders and deliveries. Currently, Caraluzzi’s consists of three stores in Connecticut and these feature fresh bakeries, an extensive produce section, prime cut meats, dry goods, and a café. They compete with larger competitors by keeping their prices low, having great customer service, and offering an excellent selection of food. Saeed’s International Market is a small grocery store that focuses on Mediterranean and Middle Eastern goods. Their selection of teas, coffee, sweets, falafel mixes, and more is actually really excellent. They also have a fresh bakery section that sells delicious pastries, such as baklava, and a casual spot for fresh sandwiches. The selection of fresh phyllo dough is also perfect if you are a home-baker, as the sheets can be purchased in different thicknesses. The Crown is stocked with only Kosher goods, so shoppers can feel confident that foods follow their specific religious traditions and beliefs. Their delicious in-house bakery is a real highlight, serving babka, challah, rugelach, bagels, and many more delicious options. They also have a Kosher deli and a take-out spot serving delicious dishes with a focus on traditional Jewish foods like matzo balls and blintzes. Do note that the Crown Market is closed every Saturday in observance of the Sabbath. Serving the community for more than 80 years, Hall’s aims to serve its loyal customers only the best goods on the market. Stop by for fresh deli meats, prepared foods, and custom cut steaks. Mouthwatering $5 meals are available on Monday through Saturday and specials are often held to make things even more wallet-friendly. 5 Star Farmers Market is a large grocery store carrying imported and specialty Asian groceries with Vietnamese, Thai, Laos, Cambodian, Chinese, and more products available. Here you’ll find a wide variety of rice noodles, spices, teas, and sauces. 5 Star Farmers Market also carries hard to find Asian produce such as lychees, rambutan, and potent durian. OMI Oriental is an Asian grocer and educational center that aims to teach shoppers how to cook delicious Asian meals. Their friendly staff can show you how to select delicious vegetables and use these in healthy, filling stir fries and other dishes. At OMI, you’ll find a ton of rice options, seaweed and nori, snacks, kimchi, noodles, and more. In addition, they also have an imported ceramic section selling beautiful Asian bowls, teapots, and other dishes. 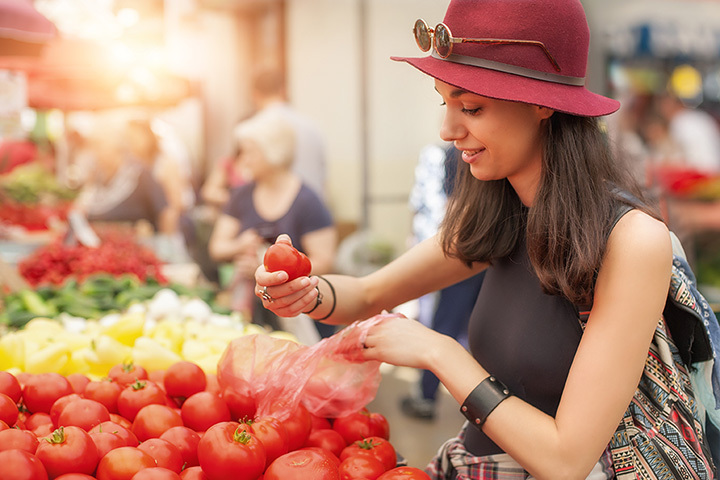 This high-end grocery store has everything you could need with its lovely florist department, great prepared meals, fresh produce, aisles of dry goods, meat and seafood counters, and pharmacy. McQuade’s also boasts of a really great café/restaurant, good for a quick stop for lunch, and an excellent bakery. Pasta Vita is a perfect place to stop to pick up a prepared meal to go when you are super busy. Their gourmet food is sure to pick you up after a long, long day. Their extensive menu offers tasty options such as stuffed peppers, flank steak with fried rice, chicken alfredo pasta, coconut chicken, and so much more. Most meals only require a quick heat-up, so you are ready to feast in minutes.